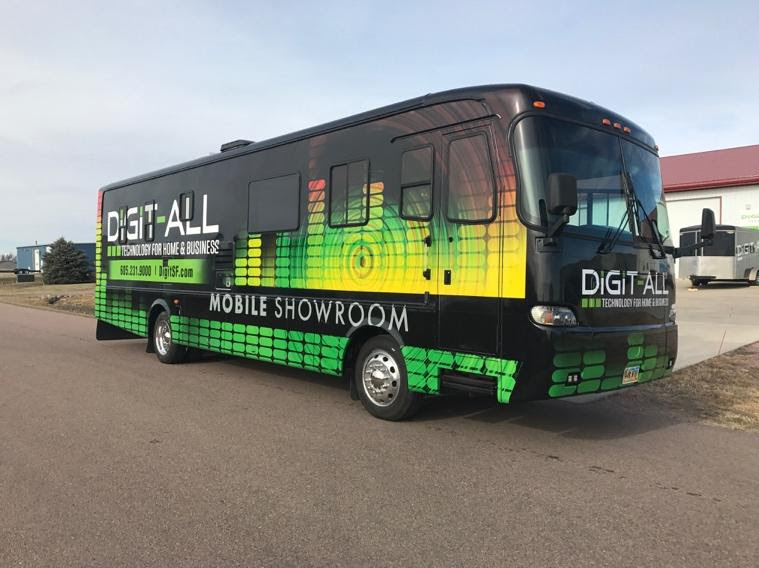 Sioux Falls, South Dakota integrator converted an RV into a high-end, high tech mobile showroom featuring ELAN control and SpeakerCraft audio. Mobile showroom cuts prep and breakdown time for home shows and conventions from approximately 100 man-hours to less than 10 man-hours. As many technology integrators know, the best way to demonstrate the life-changing power of home and business automation to customers is to let them experience it themselves, often in a showroom or an existing installation. But according to Wade Backman, President of Sioux Falls, South Dakota-based Digit-All, those solutions still put the onus on the customers - they have to come to you. While brainstorming ideas to increase sales of the ELAN control system and demonstrate the smart home experience without a massive brick-and-mortar investment, a light bulb went off. Or maybe it was an RV headlight. In less than seven months, the team along with TJ Paige Construction gutted and retrofitted a 38-foot RV into this rolling high-tech experience, complete with a home theater, office conference room, indoor and outdoor audio and video, automated lighting, motorized window shades, a surveillance system, security, HVAC, a wireless network and full control from any smartphone or tablet. Using ELAN control to tie everything together into one simple system, all of these features are controlled through the intuitive ELAN app on any mobile device, the on-board 7-inch ELAN touch panel or an advanced ELAN TV remote in each room. Every part of this RV is dressed to impress. Upon entering, guests are immediately awed by the 65” Sony TV dominating the front theater room, complete with in-wall speakers, a subwoofer, a luxurious couch and an advanced ELAN HR200 remote control. Video content is delivered from a Sony Blu-ray player, an Apple TV or a laptop through a wireless Microsoft adapter. With their jaws still on the floor, guests’ attention turns past the theater to the conference room, where an even bigger 75” Sony TV rests above a custom-built conference table. This TV has a special trick of its own, allowing meeting leaders to annotate directly on the TV and save the presentation through the innovative eBeam system, which turns standard HDTVs into digital creation spaces. There’s no need for a digital whiteboard or touchscreen, something Digit-All is excited to show off. So far, visitors have been floored by the experience and have spent an average of 25-30 minutes in the RV exploring and discussing the capabilities of the system. Within the ELAN app there are buttons to view feeds from the Luma surveillance cameras, adjust the climate, open the motorized window blinds, arm the security system, control all the TVs and speakers, and make fine adjustments to the custom-built low-voltage LED lighting. For most people, it’s like stepping into the future. But that’s not all. As frequent vendors at home and garden shows and technology conferences, the Digit-All team knew an indoor-only showroom is nice, but adding an outdoor area would drop a whole bunch of cherries on top of its high-tech sundae. Using a custom-built TV mount, the team installed a 55” Sony TV that faces out through a large custom-built window, then added outdoor speakers and a subwoofer that pop out from the underside of the vehicle. It is all controlled with remotes or mobile devices, just like the inside, showing that anything can be done, and giving a preview of the team’s next showroom project. Despite the custom work required to outfit an RV with a mobile technology showroom, this approach is saving Digit-All big bucks on marketing and in-person presentations. The benefits really started to add up at a recent home show, where the team had a lot less setup and breakdown required since they can just drive the mobile showroom in and set up a larger outdoor area. This cut the total installation and breakdown time from approximately 100 staff-hours to less than 10 staff-hours, while also ensuring that nearly everything is already connected, functioning properly and ready for lots of hands-on guests to experiment with. It’s a public event setup that most vendors and booth operators only dream of. The entire electronics system is integrated with an ELAN gSC2, the brains of the showroom, as well as ELAN amplification that power in-ceiling SpeakerCraft speakers throughout the interior. Additional amps and speakers connect to the theater and conference room TVs, making multiple audio zones. A 7,500 Watt Onan generator ensures all equipment, including HVAC, can run in any location, while a standard RV connection allows use of a regular wall outlet for power when available. Newer PostBigger and Better Stampede Drone Pavilion Takes Off at ISE 2018!